With the news that Montana's Will Cherry will likely miss 10-12 weeks with a broken foot, the word is that either Keron DeShields or Jordan Gregory will be starting in his place during that time. I am guessing that not many people know about them, so I thought we should shed a little light on their games. If I had to bet, I would say that Keron DeShields would be the one to take the starting spot. He is 6'2'', and though he seemed a more natural fit at the two, a backcourt of him and Kareem Jamar could work. He played 161 minutes last year as a true freshman, and didn't have a ton of impact. He made 8/22 from downtown, but was very much a situational and mop-up player. However, he certainly has the talent to take on a bigger role and be a very nice player for Montana. Anyone that knows about his background knows that mentally, he is a very tough guy. He had a tough upbringing, and so you know the moment of starting would not be too big for him. He is a diverse offensive player, with the ability to hit from the outside or take it to the rim. He averaged 20 ppg in high school in Baltimore. In his limited time last year, he didn't dish out a bunch of assists, but he did have a solidly low turnover rate. I believe he will have a very bright future for Montana. Jordan Gregory played a bit less (75 minutes last year), but I know Grizzlies fans think he will have a nice career. He was only 2/9 from downtown, but from watching him in warmups, he has a nice, fundamentally sound stroke (which I know was something a lot of the scouting reports said he would need to work on. He is a very good scorer, and scored 24 ppg as a junior in high school. 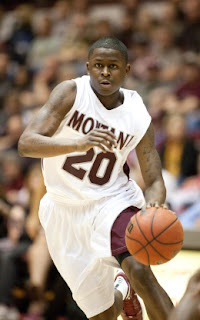 He seems to be to be a bit more of a pure PG than DeShields..
Montana fans, who do you think will get the nod in Cherry's absence? This is less based on what each did last year, which was limited but what I know of the players from their senior years as well as what I am hearing based on Griz practices and evals. DeShield while he can score is known more as a pass first point guard. He is tough gritty player who the coaches love for his willingness to do what ever they want of him. Very Coach-able. That is why he earned more playing time last season. Gregory is more of a scoring point guard. He has played the position most of his career but lead the the state of Colorado in scoring his senior year. He can hurt you in a lot of ways. Look for these guys to play side by side in the future , but for now they will battle for an early starting spot. It will be real interesting to see which direction Tinkle chooses to go, but a lot of it could come down to who worked harder this off season because they were real close last season. Thanks for the info mslacat, I was hoping you would chime in. Very interesting, I actually wouldn't have guessed that based on watching them in [limited] action. I am excited to see DeShields/Gregory/Henderson these next 3 years... I think all three really have great futures. While it stinks big time to see Cherry go down, it will be fun to watch the new guys battle it out and turn a lot of heads.